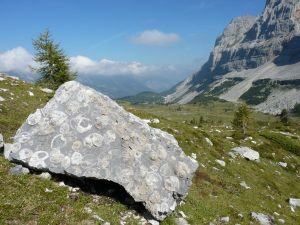 Geosites are the key to understanding a Geopark. They are places that testify in a clear and exemplary way the evolution of the earth’s crust or the influence it has had on the development of life and man. Precisely for this reason they are elements of Geological Heritage. In fact they include outcrops of rocks, soils, fluids, minerals, fossils and even particular forms of the landscape. They have been registered in collaboration with the Museo delle Scienze di Trento (MuSe) and Servizio Geologico della Provincia Autonoma di Trento. The selection criteria took into account: integrity, rarity, representativeness for the History of the Earth, educational value,, state of conservation, naturalness, geological value, scientific interest and landscape, historical, cultural and ecological value of the geological site.